The more famous HMS Amethyst, launched in 1943, was involved in the Yangtze Incident during the Chinese civil war in 1949, but her predecessor was a cruiser that was launched in 1903 and saw service during the First World War. Prior to the Gallipoli landings in 1915 the Royal Navy tried to force the Dardanelles but were faced with the problem of ten lines of mines laid by the Turks. Protecting these minefields were coastal forts and mobile batteries, pulled by oxen. On the night of 13/14 March 1915, HMS Amethyst was supporting six trawlers that were being used as mine-sweepers trying to deal with the last of the lines of mines, the Kephez mines. The mobile Turkish shore batteries opened up on them and four of the trawlers were badly hit. 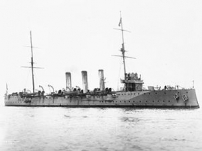 HMS Amethyst was also hit. One shell damaged her steering gear and another exploded in a bathroom where stokers were washing having come off duty. So mangled were their bodies that it was difficult to tell exactly how many of them had been there. All in all, twenty one crew members were killed, including five men from London.